You have a class list, or several, and you need to manage those names. Your principal may need a list for various reasons, or you may want to email all the students in your class, or you may want to import your students into a new web service that you’d like to use. Now you could manage the list manually, creating the different formats one student at a time. Or you could teach like a hacker and let a spreadsheet do all the hard work. My examples are going to use Google Sheets, but the concepts are the same in almost every spreadsheet. It’s been awhile since I’ve used AppleWorks on an Apple //e, so I don’t know how well these steps would work there. Cells are referenced just like in the game Battleship. Cell A2 is in the first column, second row down. I’m going to assume you can use copy and paste to highlight your class list in your student information system software, copy, and paste it into a spreadsheet. Lets start by creating the spreadsheet. Go to Google Drive and create a new spreadsheet. 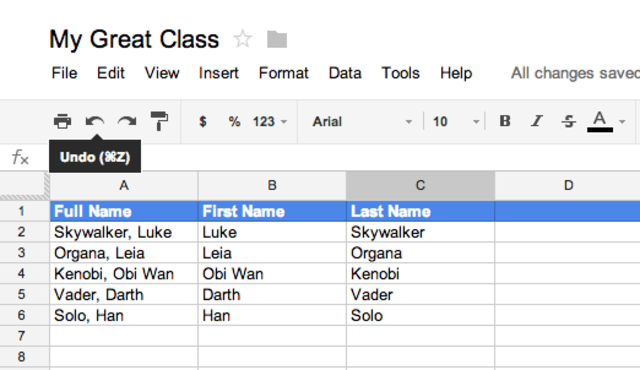 Click on Untitled spreadsheet in the upper left and name it My Great Class. In the first row put Full Name, First Name, and Last Name as column headers. Now lets make the column headings pretty. Click on the 1 in row one on the left to highlight the row. Then use the two formatting text icons to set the text color and background color. Then click the Bold button for good measure. It’s a class list alright, but now we have a problem. How do we get the last name and first name without re-typing? We are going to use a function (sometimessometimes referred to as a formula, depending on your software). Click in C2. You should be to the right of Skywalker, Luke. Looking at our list, we notice that there is a , after each last name. We can use that in our function to know where our last name ends. The function in Google Sheets that we are going to use is called LEFT(). Functions take parameters, the little pieces of information that you want the function to work with. the LEFT() takes one mandatory parameter and one optional. Hit enter. Looky there, we grabbed the S from Skywalker!! Parameters are separated in the function by a comma. Let’s add another parameter to LEFT(), and that is to tell it how many characters to grab. Breaking down the second parameter, you have SEARCH(",",A2)-1. SEARCH(","A2) is going to return the position of the comma, which we know with A2 is 10. The -1 subtracts one from the answer of the search function, leaving us in this example with 9. Congratulations, you now have cut out Skywalker. To copy the function to the other cells you’re going to want to use fill down. Select cell C2 if it isn’t already selected. Mouse over the square in the bottom right of the cell, and the cursor turns into a crosshair. Click and drag down to cell C6. When you let up, it will fill in the cells with your function, automatically changing the references to reflect the row. Now lets go to B2 and work on the first name. We can’t use the left function because it always starts at position 0. But we can use the MID() function, which takes 3 mandatory parameters. 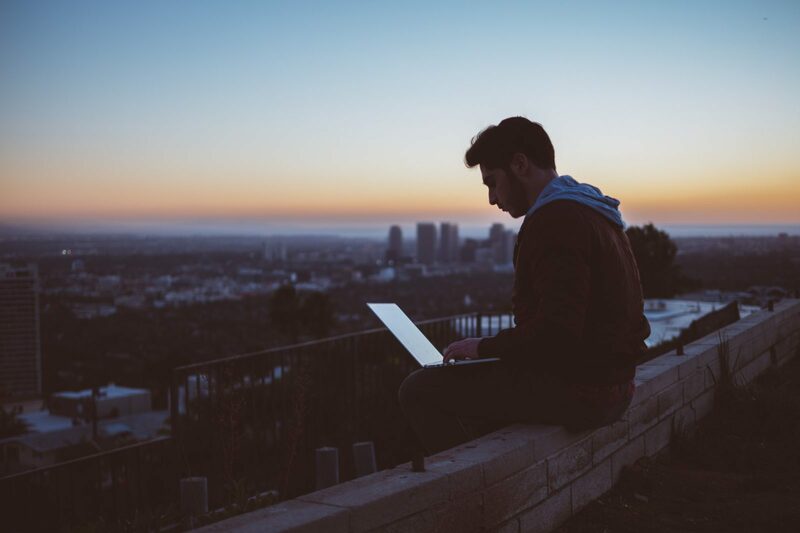 Feel like a hacker yet? Let’s break down the three parameters in that function! LEN(A2)-SEARCH(",",A2)+2: Take the length of A2 and subtract the position of the comma then add two to skip over the comma and space. This gives us the length of the string to return. Then fill down the function from B2 and it should populate your first name fields. Always, ALWAYS feel free to play around with the functions until you get them right. You should have the start of a great class list!